Dr. Clyde S. Kilby, late professor of English and founder of the Marion E. Wade Center on the campus of Wheaton College, is closely associated with seven British authors, particularly C.S. Lewis, Dorothy L. Sayers and J.R.R. Tolkien. In light of those interests, Kilby is not often mentioned in relation to American Pulitzer Prize-winning playwright Thomas Lanier “Tennessee” Williams (1911-1983), author of Cat on a Hot Tin Roof, The Glass Menagerie, Night of the Iguana and many other successful plays, short stories and films. But there is a connection, however slight. 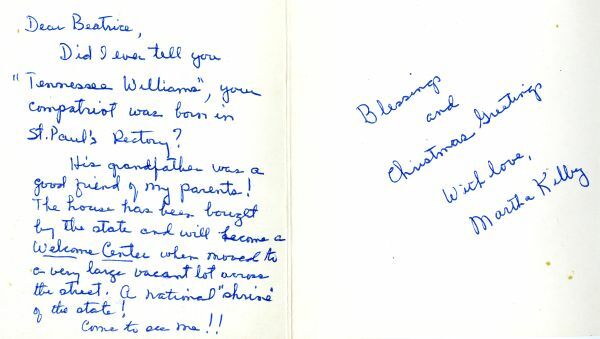 As this Christmas card to a colleague reveals, Clyde and Martha Kilby’s roots sprawled deeply throughout the rich southern soil that also produced one of America’s greatest writers. 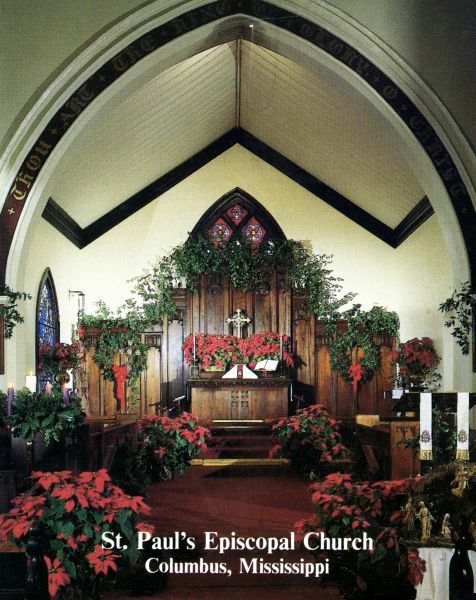 After years of profligate sexual activity and prescription drug abuse, Williams famously sought to “get my goodness back” by joining the Catholic Church in 1969. Evidently, Williams hoped to vivify not only his personal piety, but also his lagging creative and professional career. Instead he found himself more interested in ritual and architecture than doctrine. As a result, his renewed interest in spirituality did not solidify and he descended into a drugged stupor throughout most of the 1970s, only periodically producing new work. If Tennessee Williams had discovered the writings of Lewis, Sayers, Tolkien and the other authors represented in Clyde Kilby’s Wade Center, perhaps his desire for a lively, enduring goodness might’ve permanently settled his disquietude for the final act of his life. According to the website for the Tennessee Williams Home and Welcome Center, the rectory in 1993 was in danger of being torn down to accommodate a church expansion. In an effort to preserve this historic literary landmark, the yellow and blue gingerbread home was loaded onto flatbed trailers and moved to Main Street, where it was restored. Three months after the grand opening, Tennessee Williams was honored with a U.S. postage stamp, and a public ceremony was held in the home. Recently honored with the designation of a National Literary Landmark, the home serves as the official Welcome Center for Columbus.